Join our Bakers Avenue neighbours, Hornbeam, Organiclea, Hedge Herbs and Forest Recycling Project in celebrating culinary herbs. Have lunch with a herb twist and take home herbs in upcycled pots, planting tips, recipes, stories on a growing theme and much much more. 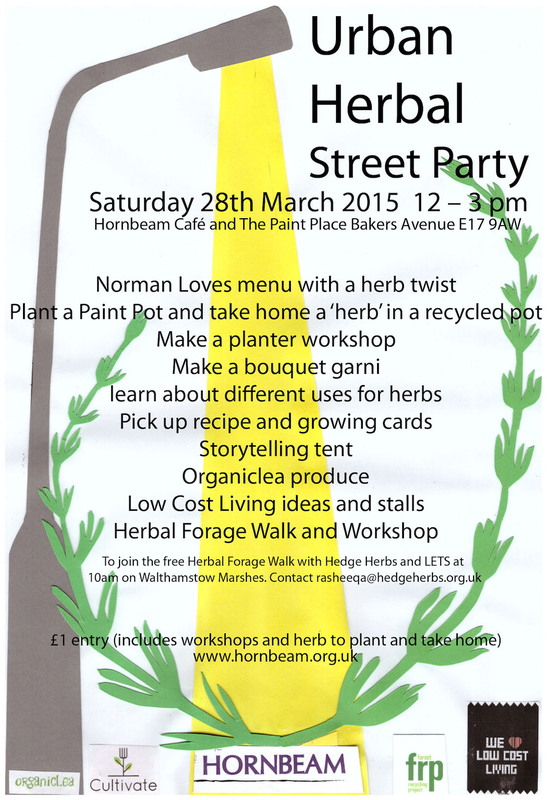 £1 entry to the street party includes herb plants and workshops. Join Waltham Forest community herbalist Rasheeqa Ahmad of Hedge Herbs, urban forager Willy Forbes, and Waltham Forest LETS for a spring forage on the Marshes and then gather back here for some favourite springtime plant foods. This event is part of the Cultivate Programme, and runs from 12 pm – 3 pm on 28th March on Bakers Ave, in the cafe and in FRP paint place and yard.